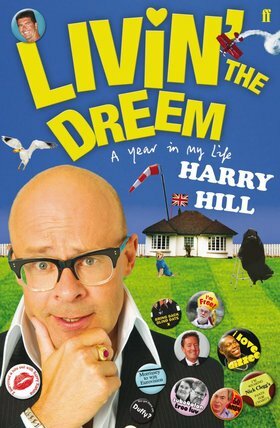 He doesn’t only release DVDs, books are also part of the Harry Hills creations. His latest one is called Livin’ The Dreem, which is a year in his life. But not quite like that….. This isn’t a serious book. You can tell that by looking at the cover (right) and seeing the badges which say things like “I survived a nite out with Kerry Katona”, “I love Dizzee” and “I’m wearing Nick Clegg’s pants for charity” – this is typical Harry. On the inside of the cover it says “Think Samuel Pepys meets Katie Price on a bouncy castle”. The best way I can describe it is; think of it as a bit like TV Burp in a book. It is very much the same surreal style of comedy. So is it any good? Yes. Right from the beginning to the end it made me laugh. It starts with him describing how he did the usual of having Amanda Holden round for christmas lunch, and so it begins! < ?php include 'adsense.php'; ?>This book is relentless in it’s sillyness. Right from the opening line to the last line, he never lets up. I don’t want to fill this review with spoilers, but he comes up with all sorts of ridiculous situations and the stories continue through the diary between days and weeks constantly resurfacing. He does cover literally everyday so it’s a nice chunky 469 pages of goodness! So you get decent value for money. This book will not be everyone’s cup of tea, I know some people who can’t stand the man, but if he does make you laugh or you enjoy the style of comedy this book is well worth a peek. It is for sale now as a hardback, you can also get paperback, audio and the Kindle version.